Anything you can record, you can record better. 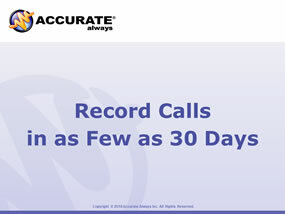 Accurate Always provides the tools that contact centers, healthcare, aviation and governmental organizations need to record, monitor, retrieve and manage their voice and video communications. Voxida is Accurate Always� platform for recording VoIP, digital and analog calls. It scales to accommodate thousands of extensions and channels in a single call center installation and is able to record and monitor calls across enterprises and facilities around the world. Voxida is compatable with the vast majority of communications systems and easily works in a hybrid environment. The Voxida call recording systems are used to reduce liability, ensure regulatory compliance and improve customer interactions while easily fitting into existing work-flows and onsite technology. Users can retrieve calls, monitor their quality and report on them, all using a single interface in standalone or multi-site environments. Voxida Viewer, a user-friendly client application, provides call center agents, supervisors, managers and administrators with the tools they need to assure quality interactions, get real-time contact center diagnostics and review calls after they have transpired — or even while they are still in progress. As highly configurable solution Voxida allows users to specify which department, agent or supervisor can access certain calls and specify which calls are recorded on an extension-by-extension basis. See Voxida now.